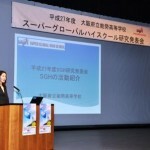 On Saturday March 12th, we held this year’s SGH presentation session in Nose Municipal Joruri Theater Hall. Through our education, Nose High School engages in research and development around the theme “Nurturing global talent by cultivating the ability to discern and act wherever there is international cooperation”. Twelve Second Year students of the SG Focused-Area lectures have been focusing their research on the theme “Economic Growth and Destruction of Nature in Malaysia”. 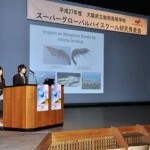 In this presentation session, they gave presentations in English on the results of their research assignment from the former half of the year under the instruction of Ms Yoko Inui, assistant professor at Osaka Kyoiku University, and in Japanese on those from the latter half of the year under the instruction of Mr Toshiyuki Saito, a community revitalization manager. In this session, our students were able to build courage through delivering presentations in English in public, discover local issues with a global outlook and study ways to find solutions to important issues. 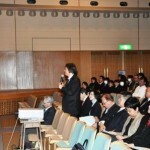 Mr Toshihide Katayose, of Mitsuya Koryu Tei; Mr Atuskuni Hirata, of Sankei Shimbun Social Welfare Association; and Ms Yodosi Shouko of the Osaka Prefectural Board of Education. They were kind enough to offer us encouraging feedback and criticism regarding our students’ English abilities and their research themes. Our invited guests were: Mr Nobuteru Ikejima, Senior Advising Officer of Osaka Prefectural Board of Education; Mr Kazuhiro Ueshima, Osaka Prefectural Assembly member; Mr Tadashi Yamaguchi, Mayor of Nose Town; and Mr Masahiko Morita, Superintendent of Schools in Nose Town. 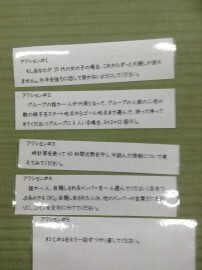 Our guests gave us encouraging words and expressed their great expectations and hopes for our school and SGH activities. We highly appreciate the fantastic audience turnout, with as many as 150 people attending our presentation session. We will keep working on SGH theme research with the cooperation of the local community and government, and sincerely wish for your continued support and understanding. In the morning of Saturday 7th March, we held the 35th and 36th instalments of the Second Years’ SG Focused-Area Lecture series. 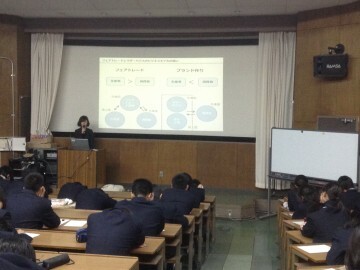 Ms Yoko Inui of Osaka Kyoiku University delivered the final classes of this year’s theme research lecture series. 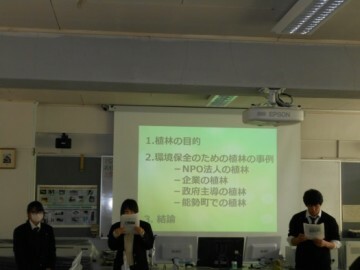 In these classes, three groups of students worked on making presentations to be given at the SGH research presentation session at Joruri Theater Hall on the 12th March. Ms Inui gave each group detailed feedback, which the students used to improve and expand their presentations, as well as rechecking references in order to improve depth of content. 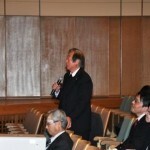 Mr Kazuhito Uni was also in attendance. Mr Uni is a postgraduate student of the University of Malaya who advised us when we visited the University of Kuala Lumpur and gave presentations last November. 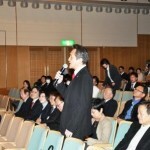 He was visiting Japan, and was kind enough to assist with the lectures. In the later half of the lectures, the three groups of students rehearsed their presentations in full in order to check and practice the timing, while Ms Inui offered further feedback and advice. On Thursday February 18th, we invited Mr Shouhei Kobayakawa, a former member of the Japan Overseas Cooperation Volunteers, to deliver our First Years’ 16th SG Basic Knowledge lecture. 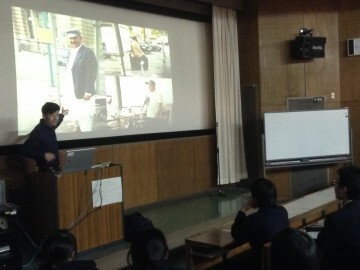 Mr Kobayakawa talked to the students about his experience of world travel. He grew up in Nose, and had been longing to go abroad since he was in high school. After quitting his job as a car mechanic, he travelled around the world as a backpacker. After the big journey, he joined the programme of Japan Overseas Cooperation Volunteers and instructed on car maintenance in Fiji for 2 years. After that, Mr. Kobayakawa was hired by a minesweeping company. He worked as a machine control instructor and a maintenance engineer in Mozambique and Angola. Having started his globetrotting adventure with only a little English ability, and eventually going on to clear mines in some of the most dangerous areas of the world, Mr Kobayakawa is now back in Nose. He hopes to be able to use his experience of the world to create ideas to contribute to the local community. His speech and his story were quite inspiring, and our students were given a lot to think about, both on the global and local stage. 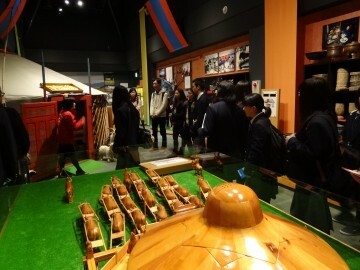 On Saturday January 30th, thirteen students attending the SG Focused-Area Lecture visited the Minoh Association For Global Awareness (MAFGA) at Minoh Multicultural Center. To start the day, the director of the center, Asuka Iwaki, made a speech about what MAFGA is and what it does. 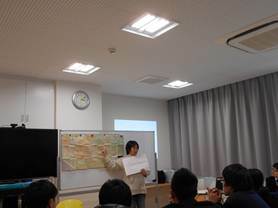 Next, Ryoko Imaoka from Osaka University gave a lecture in English on the subject of Mongolia. She described some basic information about the country with the aid of hand-drawn illustrations. In a similar vein, Ms Enebish, an exchange student from Mongolia, talked about her birth town, and Mongolian culture and tradition. To round off the event, we moved to the center’s “comm café” and had the chance to talk with staff members Ms Andréia from Brazil, Ms Kim Hee-Jeong from Korea, and Mr.Chen Hsing-yin from Taiwan. We had an in-depth discussion about with them the cultures and traditions of various countries. 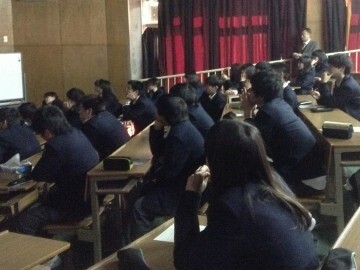 On Saturday January 30th, we invited Mr Shinji Fujioka, an educational adviser, to deliver our Second Years’ 31st focused-area lecture. 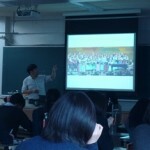 This was the final lecture of five successive Active Learning Lecture Series given by Mr Fujioka. 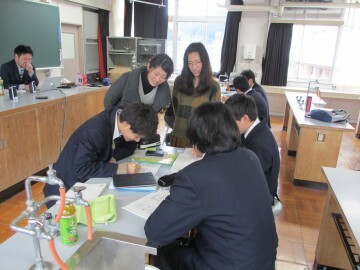 We also had the help of two Kwansei Gakuin University students in hosting the accompanying workshop. The theme of this class was “Creativity”. 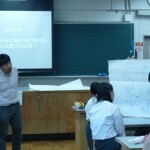 Mr Fujioka started with an explanation of what creativity is, and as the lesson went by, told our students that they should use their own creative thinking to solve problems which cannot be solved, such as some situations from the “problem-solving methods” portion of the last lecture. Students then worked on a case study named “Connect 9 dots without lifting the pen” for learning how to generate creative ideas. It gave them ideas for how to generate a good quantity and variety of ideas. 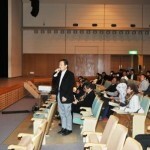 The next workshop was entitled “Create a TV program”. Students were divided into three groups, and practiced sharing ideas under different instructions, such as “give as many ideas as you can” and “categorise ideas according to methods or concepts”. Through this lecture and workshop, students discovered the necessity of creativity and some ways of presenting creative ideas for problem solving. They had many opportunities to show their own creativity at a group presentation session and were able to present some unique ideas. On Saturday December 26th, we invited Mr Toshiyuki Saito, a community revitalization manager, to deliver our Second Years’ 27th focused-area lecture. Continuing from the last project study lecture, it was titled “SGH and regional revitalization: effective use of project study in the community”. Students worked in groups to discuss and research new project themes. We learnt that making flow charts or tables and translating them into English to use them in presentations can be an effective way to solve problems. As concrete themes, we thought about the different types of tree planting and their significance. We summarized the roles of both planted forests and natural forests and discussed current issues pertaining to the subject, as well as considering some possible solutions for those problems. 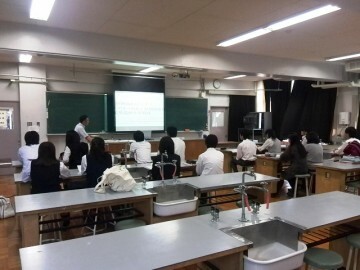 On Sunday 20th December, the 10th Education Research Conference of Osaka integrated-course high schools was held at Osaka Municipal Sakuya Konohana Senior High School. Our school exhibited and presented our SGH activities with eleven Second Year students who are taking the Super Global Focused-Area Lectures. 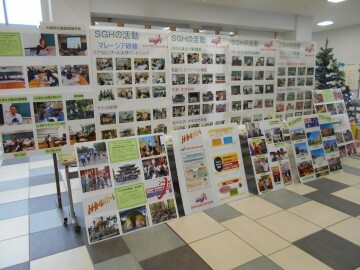 In the morning session, we exhibited our SGH activities with posters and handmade information boards. We also took the time to practise and rehearse for afternoon presentation sessions. 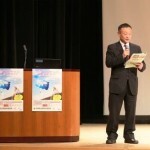 The conference started with the opening ceremony at 1pm. We had the opportunity to see presentations from several high schools with integrated courses. 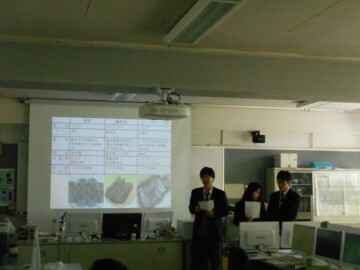 Our Nose high school members gave the penultimate presentation. In it, we gave a basic introduction to the Super Global High School program and explained some typical activities and research topics, and gave some reports about field work during our study trip to Malaysia. Some students said they were so nervous that their legs were shaking during the presentation, despite having had several prior experiences of public speaking. It was more nerve-wracking this time because there were a lot of teachers and students from high schools all around Osaka in the conference. 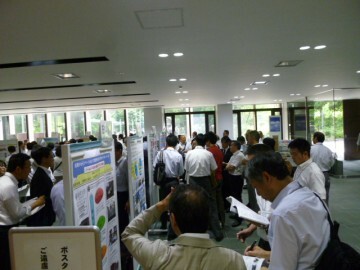 However, our students’ presentation was wonderful, and we in the audience didn’t pick up on their nerves. This event will have given them some invaluable experience in dealing with nervous situations. The Second Years’ 25th focused-area lecture was held on Saturday 19th December. 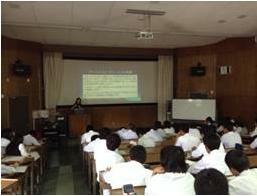 It was the second class on leadership by Mr Shinji Fujioka, an education advisor. 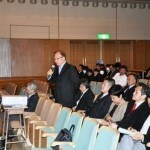 The theme of the lecture was “global human resources can be nurtured locally”. First, we watched a video on leadership and exchanged opinions on what we had seen. 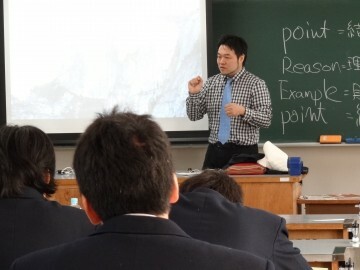 Mr Fujioka explained how “global human resources communicate with heaven (Global), and inspire the people to encourage the earth (Local).” Students had group discussions on abilities that a global human resource should have, and shared their ideas with the class. Lastly, there was a lecture on Project Based Learning (PBL), and Mr Fujioka wrapped up the class by giving us his own views about the skills of a global human resource. 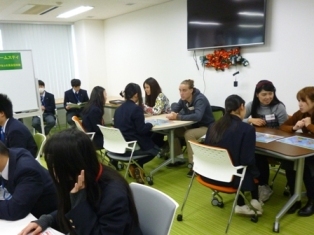 On Friday 18th December, we visited ECC Kokusai College of Foreign Languages and took part in their global experience programme. We practiced English phrases which are used for checking in at the airport, talked one-on-one with international students studying at ECC, and took a lecture on Japanese traditional arts. Many of the students were not used to talking to foreigners and were anxious, but most of them seemed to have gained some confidence through this programme. The international students all came from non-English speaking countries and spoke English as a second language. For most of them, Japanese was their third language. They told our students that it is okay to make mistakes, and that it’s important to try to speak the language. It was a great opportunity for our students to learn the importance of English communication in preparation for the graduation trip. 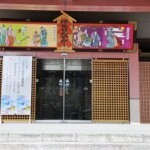 On Thursday December 17th, we visited the Japan Mongolia Folk Museum in Tanto-cho, Toyooka city, Hyogo prefecture. 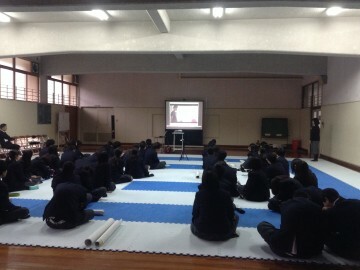 This was a focused-area lecture for the First Years to learn about Mongolian history and culture. 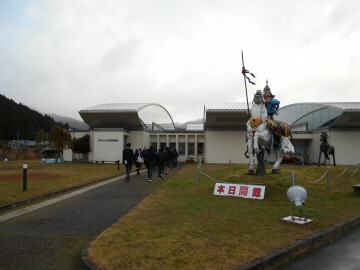 The fifteen participating students left the school at midday, picked up Ms Ryoko Imaoka, three students from her seminar, and two students from Mongolia at Osaka University Minoh Campus, and headed for the museum together. On the bus, Ms Imaoka gave a short lecture and students had a chance to talk and get to know the Osaka University and Mongolian students. 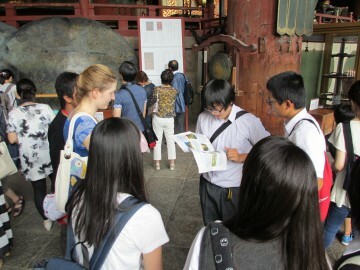 The curator, Ms Shibata, showed us around the museum. At the ger exhibit – a type of Mongolian portable dwelling – everyone was able to go inside and hear more information about the abodes; for example, the stove placed in the centre of the ger uses dried livestock waste as fuel. We got to know in detail about the daily life of nomadic Mongolians. At the national dress section, the students tried on the colourful clothes under Ms Imaoka’s guidance, and took pictures as a souvenir. In the next academic year, these fifteen First Year students from the focused-area lecture will be conducting case studies on Mongolia and will be able to visit the country. This visit to the Mongolian Museum gave the students a good chance to get to know more about what they will be studying in the near future. On Wednesday 16th December 2015, twenty students and three teachers from Universiti Putra Malaysia visited Nose high school for a study program. The event was organised by the Malaysian chapter of the Organization for Industrial, Spiritual and Cultural Advancement-International (OISCA). It was the second time for us to host Malaysian guests this year, following the visit of the high school students in June. We particularly enjoyed the colorful traditional ethnic clothes that our visitors wore! We started the program in the morning with the welcoming ceremony, attended by our Second Year students. 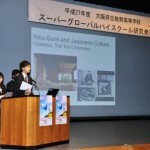 Representatives from both schools made speeches, while students described life at their respective institutions, exchanged souvenirs, and put on some performances. The Malaysian students performed Malaysian martial arts, a dance and a song. Students from Nose gave a karate demonstration and a dance performance. After the ceremony, we had some time for cultural exchange. 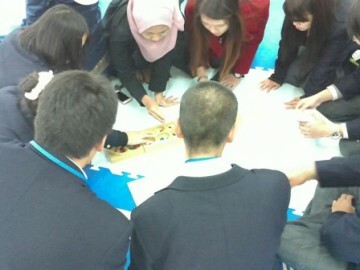 The students from Putra taught us Congkak, a traditional Malaysian game. Then, our second year students who are taking SG lectures had lunch with our Malaysian visitors, and showed them our agricultural field and Nose Joruri Theater. They even tried putting on their own Joruri performance. Having guests from Universiti Putra Malaysia gave us a great chance to learn about each others’ cultures, and all parties really enjoyed the experience. Particularly for our Second Year students who are going to Malaysia for their school trip, it was great preparation to encounter Malaysian culture first-hand. On Monday 2nd November, we had the pleasure of receiving Kaori Hamaguchi, the manager of the Osaka location of the bag retailer MOTHERHOUSE, as she delivered the First Years’ 11th Super Global Basic Knowledge Lecture. Her lecture was entitled “The concept and practices of Fair Trade”. Ms Hamaguchi told us of her experience of Fair Trade practice gained during her overseas volunteer work as a member of the Japan Overseas Cooperative Association (JOCA), and through the activities of MOTHERHOUSE, which is working in innovative ways beyond Fair Trade. If there is solely financial support for countries suffering from poverty, it is difficult to improve the world. MOTHERHOUSE has created a sustainable craftwork business with the concept of “working in developing countries to create products that satisfy our customers”. She showed us a bag which was produced at MOTHERHOUSE’s workshop in Bangladesh, and we could certainly feel the high quality. 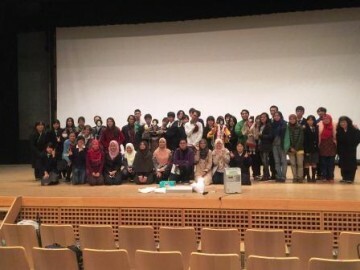 After the lecture, Ms Hamaguchi led a workshop called “If you start a business in Indonesia…”. Our students looked at a case study of an artisanal metal engraver in Indonesia, trying to identify problems with their business and come up with solutions. Each group of students then shared their ideas and opinions so they could pool their creative problem-solving resources. Today’s modern system of global trade is unfair to developing countries both economically and socially, and is only working to increase poverty. This lecture highlighted the importance of changing this system to tackle inequality and unfairness. On Monday 5th October, we held the 10th instalment of the First Years’ Super Global Basic Knowledge Lecture series. Delivering the lecture was Faith Amano, a member of the NPO Free The Children. 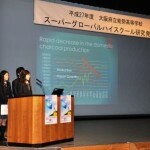 The lecture, together with an accompanying workshop, was titled “World Poverty and Child Labour”. Mr Amano taught our students about the living and working conditions of certain impoverished African countries such as Malawi, where a family of four can live on the equivalent of just ¥200 for 2 weeks. Children are forced to work for 18 hours a day in a brick factory, as well as in housekeeping, road construction, harvest cropping and even prostitution. 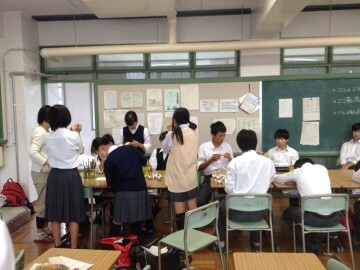 In the workshop, Mr. Amano organised an activity which he called “The Escape from Child Labour Game”. This activity helped our students to empathise with the reality that in some countries, only 50% of the population are able to receive a secondary education, and that there are children growing up in slums who have never known who their parents are. Such living conditions are unthinkable for the vast majority of people in Japan. 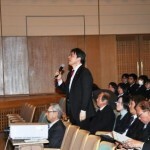 The lecture gave us some idea of what we as individuals can do for the problems of poverty and exploitation. Firstly, we should avoiding buying products made using child labour. And moving forward, we should each use our own individual talents and passions to work towards making whatever positive contributions we can to the plight of the most needy citizens of the world. 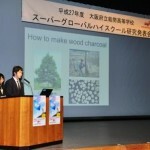 On 18th November, our guest lecturer was Mr Katsuhiko Ogino, the chairman of Minoh Association for Global Awareness. His lecture was titled “Race problems and human rights in the USA: human rights in a multiracial nation”. Mr Ogino told our students about the attitudes and thinking of the citizens of multiracial countries and human rights issues encountered there, based on his own experience during his stay in the USA for work. 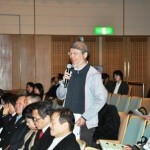 He also organized group workshops in which he hoped to explain that Japanese people tend to “read the atmosphere”, while stating your thoughts more bluntly is often important when communicating with people from different cultural backgrounds. Our students are looking forward to their school trip to Malaysia, and the crux of the visit: interacting and performing tasks with students of Assunta High School. Students have already contacted the Malaysian students through email and online. We hope that this lecture will help the students to get along with their peers when meeting people from diverse racial, religious, and cultural backgrounds. At our First Years’ 6th SG Basic Knowledge Lecture on 17th September, we were delighted to have workshops delivered by Ms Ryoko Imaoka, associate professor of Mongolian at Osaka University’s School of Foreign Studies, and Mr Shin’ichi Ajikata, an architect. These workshops were in preparation for the upcoming school festival events of “Building a ger – a Mongolian portable dwelling” and “Working with Mongolian wool felt”. 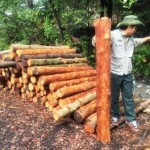 Mr. Ajikata has his own ger, and is an expert in the structure of the traditional tent. Using design drawings and a miniature model, he instructed our students in the construction of the structure, as they will be building a ger themselves. Of course, this expert advice is hugely important when attempting such a complex task. 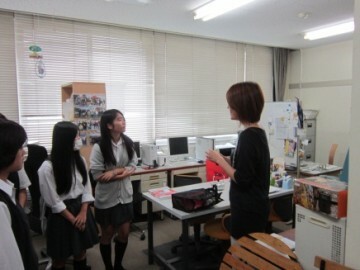 Meanwhile, Ms Imaoka taught wool felt craftwork. 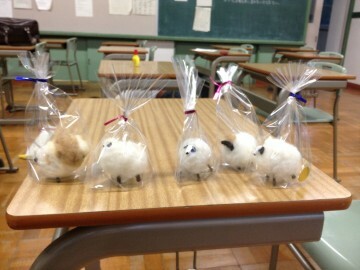 Students learned how to make sheep ornaments with cotton swabs, paper clay and wool. It’s a job that requires careful hands and precise techniques, and the students enjoyed making their own unique-looking sheep dolls. The day provided a great opportunity to become more familiar with Mongolian traditions and cultures and further broaden our students’ cultural horizons. 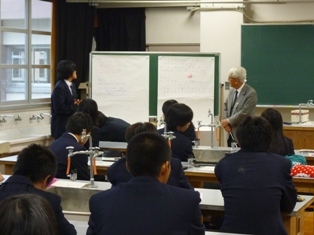 On October 28th, our guest lecturer was Mr Shigeatsu Hatakeyama from Kesennuma, Miyagi Prefecture. 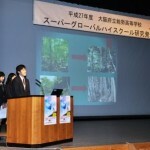 His speech was titled “Forests are Lovers of the Sea: our activities to plant trees in people’s hearts”. 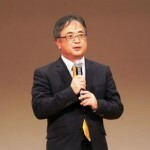 Mr Hatakeyama works in various fields, including as an oyster farmer, Professor of Field Studies and Practical Learning at Kyoto University, and is the founder and chairman of the NPO Mori wa Umi no Koibito (which translates as “Forests Are Lovers of the Sea”). Mr Hatakeyama told us that through his job as an oyster farmer, he has come to realize that people are only able to live on this earth thanks to blessings of forests. With this in mind, he has been planting trees for many years. He also holds educational activities to teach children from the local forested mountain area about the importance of forests, inviting them to coastal areas for first-hand environmental learning opportunities. Nose town and Nose High School are located near the source of the Inagawa river. Hearing Mr Hatakeyama’s speech encouraged us to think about how we can utilize the local forest resources for the future revitalization of Nose town. 2. Moments that make them happy in their own rural life. 3. Any activities they could think of to help the rural area they live in. In a laid-back atmosphere, each student gave their opinions about the areas where they live and ideas about what they can do for the local area. On Thursday September 10th, we were honoured to receive a lecture from Ms. Aya Nakamura of the Minoh Association For Global Awareness. Her lecture was titled “Crosscultural understanding and multicultural symbiosis: ‘multicultural symbiosis’ in Japan from the view of a ‘resident’”. Drawing on her experiences of studying and living abroad, she talked about the feelings people with non-Japanese backgrounds may have while living in Japan, and shared some tips on ways to communicate and live with these people. 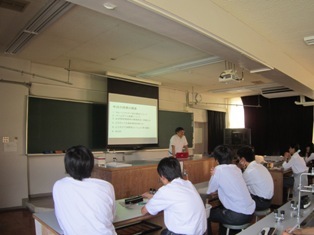 For the Second Years’ “Integrated Studies” period on Thursday September 2nd, we invited Mr. Shohei Kotsuji from Saraya Co. Ltd. to give a lecture on “Palm oil and ecoactivity in Borneo”. He talked about some activities in Malaysian Borneo that are helping to solve environmental and social problems related to palm oil production. 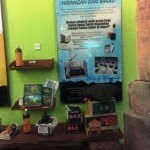 He also introduced other activities that can make the industry more environmentally sustainable. 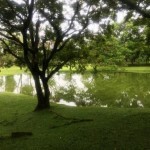 The graduation trip to Malaysia includes a visit to the Forest Research Institute Malaysia (FRIM). We hope that our students are able to keep in mind what they heard in this lecture, and to learn more about environmental problems and how they can be tackled. On Friday August 21st, the Second Years received their 12th and 13th SG Focused Area Lectures at Osaka Kyoiku University. The students boarded the bus at Nose High School in the morning, and arrived at Osaka Kyoiku University – located in Kashiwara City, Osaka Prefecture – at 10am. 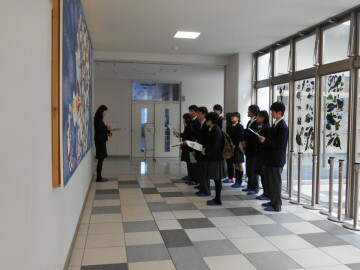 Students had the chance to take a tour around the university; highlights included school facilities, and Ms. Inui’s office. 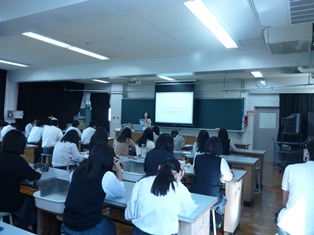 In the morning, Ms. Inui talked about several factors that an academic must bear in mind when researching. She emphasised to the students the importance of knowing clearly what the problem is. Our students were able to eat lunch at the school cafeteria with university students eating alongside them. In the evening, students were put in groups according to their research themes, and worked on narrowing down their topics. Each group was supplied with a tablet, which the students used to search the internet for information on their research themes, and to get a better understanding of their topics. 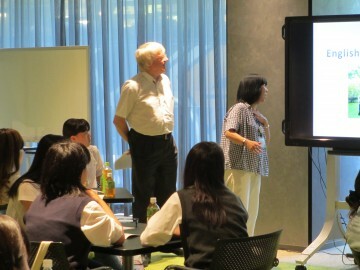 On the 28th of August, Nose High School and our colleagues at Osaka International University (OIU) held a workshop as part of the SGH programme curriculum. 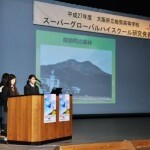 This workshop was designed to improve the students’ tourism presentation skills. 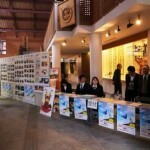 The focus was on ways to guide tourists from overseas, in English, at sightseeing places around Japan. At OIU, our students were taught English that can be used to introduce Japanese culture to the uninitiated. 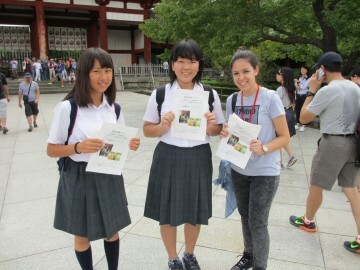 As a practical guide, sixteen of our First Year students attended the workshop and visited Todaiji Temple in Nara; the students who attended this workshop are those who are taking the “Super Global English Presentation” lecture, which is held on weekdays after school and on Saturdays. 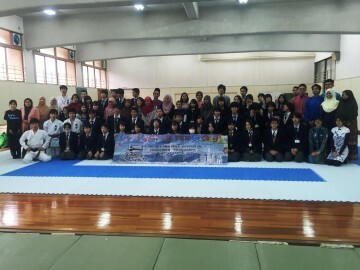 The students departed Nose HS and arrived at OIU, which is located in Moriguchi City, Osaka, at 10am. 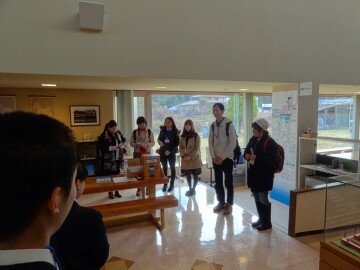 In the morning, they were given an introduction to the university, and were told about the day’s schedule by Mr. Rogers of OIU. Our students then had lunch with OIU students in the cafeteria, and headed for Todaiji by bus for the afternoon activity. 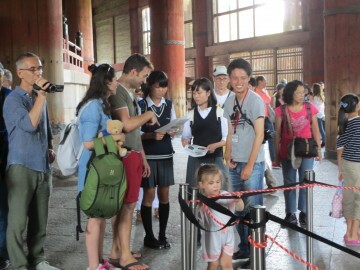 At Todaiji, groups comprised of a few Nose HS students and one or two OIU students stood at the entrance of Todaiji and spoke with the passing tourists, volunteering their free English guiding services. By meeting tourists and showing them around the Daibutsu-den Great Buddha Hall, they were able to build cross-cultural interpersonal skills. At times, our students had a hard time making themselves understood in English. 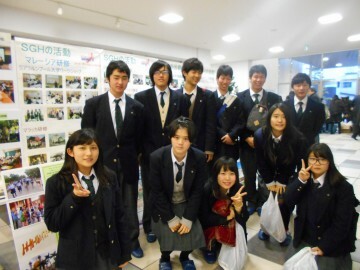 However, with help from exchange students at Nose HS and OIU students, each group succeeded in achieving a good amount of communication with at least a few tourists from overseas. It was a good opportunity for students to test the English language presentation skills and and communication skills that they have been working on throughout the SGH lectures. 12 students in the second year have been studying “Economic Growth and Destruction of Nature in Malaysia” as their SGH theme research. They will be visiting Malaysia from November 1st to the 8th, conducting an investigation to learn about the current situation in Malaysia, and participating in a workshop at Kuala Lumpur University. 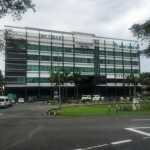 From the 2nd to the 6th of August of this year, I went to Malaysia with Mr Togashi, who is in charge of this investigation. We made the trip in order to check out the itinerary and locations beforehand, and to have some meetings with the schools. Today we would like to give you an overview of the trip. 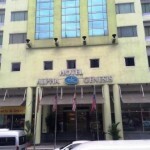 This hotel lies in the busiest area of Kuala Lumpur. 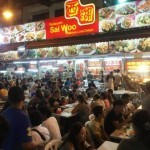 We bought dinner at a street stall near the hotel. In front of this hotel there is a big park with a man-made lake. It seemed almost like an ancient city in China. Many people were strolling and jogging in the park. 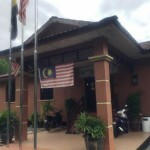 MRSM Taiping, the high school our students are planning to visit, is a boarding school established by Mara Public Corporation, where top-class students from all over the country gather. Students will plant Mangroves together, and have an exchange meeting on the school campus. 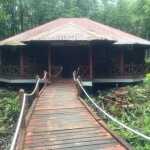 Perak has the largest mangrove propagation field in Malaysia. At this forest preserve, people can plant mangroves as part of an environmental education programme. As shown in the picture below, sticks are set vertically next to the young mangrove plants to mark where they are growing. The mangroves in this area are used to make charcoal. 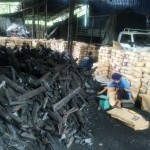 At low tide, the trees are cut down and carried to Kuala Sepetang Charcoal, a charcoal factory, by boat. This process resembles the Japanese concept of Satoyama (mountain-village living). 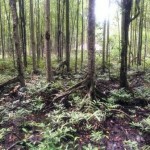 In this region, mangroves are protected, preserved, cut down and made into charcoal. 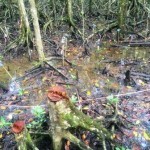 The mangrove is an important resource that drives the processes of local industry. 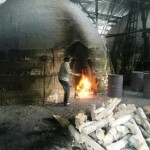 The kilns at this factory use the traditional British technique. 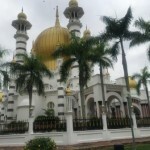 Charcoal of the highest quality is produced in Malaysia.We also visited a beautiful mosque in Taiping. ” Industrial Society and Human beings” On Friday July 16th, the fourth in the series of the First Years’ SG Basic Knowledge lectures was held. 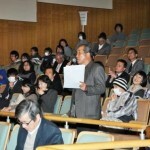 The lecturer was Ms Ryoko Imaoka, an associate professor of Mongolian at Osaka University’s School of Foreign Studies. 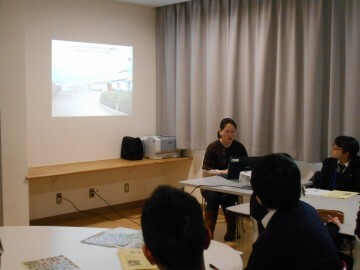 In her lecture “Living in Mongolia today”, Ms Imaoka talked about Mongolian history, tradition, nature and culture. She explained what Mongolian nomadic life is like: people live in their ger, a portable dwelling, moving their homes from season to season, and engage in stock farming. In urban areas, meanwhile, there is a significant gap between the rich and the poor. Because of this gap, new social problems have surfaced, one of which is the emergence of “manhole children”. Students learned about the complicated two-sided situation of Mongolia: one with wonderful culture, nature, and a spiritually rich life; another with a poor and severe standard of living. Ms Imaoka is supporting the Gender Center, a shelter for children and single mothers suffering from poverty in Mongolia. 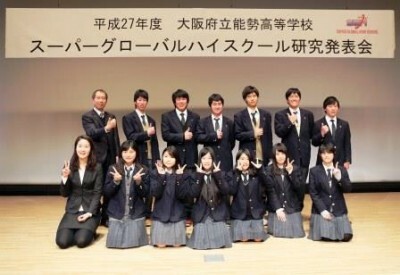 At Nose High School students in e First Year conduct a charity activity at the school festival, and the fund collected there is sent to the Gender Center. “Industrial Society and Human beings” On Thursday July 9th, the third class of the First Years’ SG Basic Knowledge lecture was held. 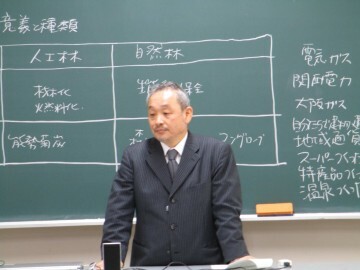 The day’s lecturer was Mr Toshiharu Kiyomizu, director of the Kansai Training Center of The Organization for Industrial, Spiritual and Cultural Advancement (OISCA). 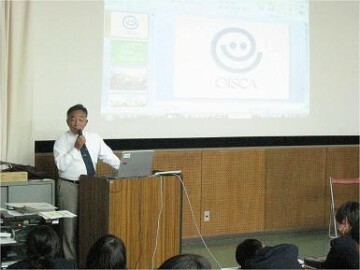 Mr Kiyomizu talked about “OISCA’s role and activities”. 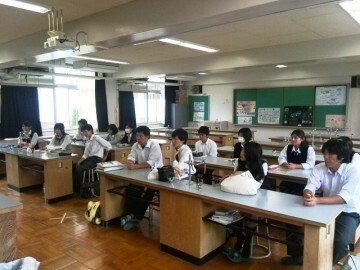 He introduced the students to various activities conducted by the international NGO OISCA both inside and outside of Japan, including environmental protection, technology support, and helping the poor. 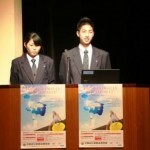 Students learned about the present situation of the world, and the importance of international volunteer activities. 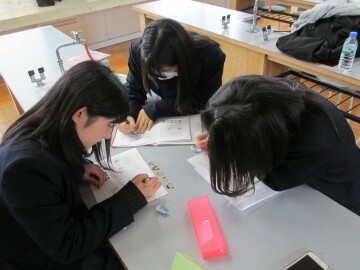 There is a strong bond between Nose High School and Kansai Training Center: students in the First Year who took these SGH lectures conduct research studies on OISCA at the annual school festival. They also cook and sell the traditional Philippine dish Camote Q – a kind of deep-fried sweet potato – under Mr KIyomizu’s guidance. The proceeds go towards for OISCA’s reforestation act in the Philippines. 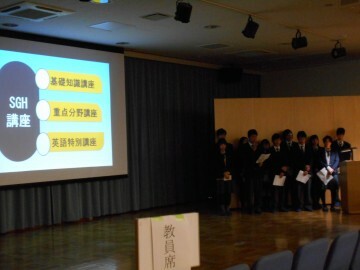 On Wednesday July 8th, seven of our students attended an event titled “Learning from our seniors at Nose High School” held at Nishi Junior High School. 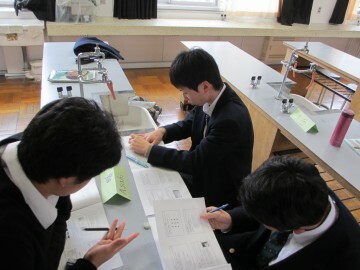 Three of the seven, Kokomo Onari, Nagisa Kinoshita and Yuta Matsumura are Third Year students from the junior high school. 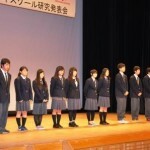 The others, Kenta Nakaue, Asahi Hata, Kurumi Matsuda and Misaki Murakami are Second Year students from the same junior high school and they have chosen to study the SG Focused Area Lecture series. They made an introductory presentation on SGH in English. The third grade students gave presentations on the reasons why they chose Nose HS, their own future plans, life in Nose HS, what is good in Nose HS, and Saturday lessons. They looked nervous but did well to make the presentation easy to understand and put across their thoughts on the subjects. They also gave examples of activities that they worked on during their high school days such as classes, clubs activities, the student council, and so forth. 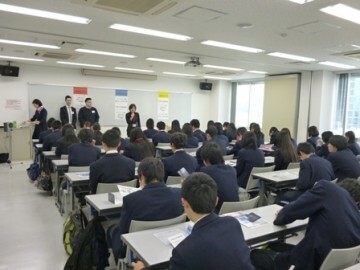 They encouraged the junior high students to enjoy the rest of their junior high student life, giving tips on how to boost concentration when working on things that they would prefer not to be working on. The second grade students have had only three lectures of the SG Focused Area Lecture series, and four English special lectures. However, they used simple English and explained SGH very well by using PowerPoint. It was their first presentation in English, and they made it because for the SGH program, explaining projects and activities in English is a must. 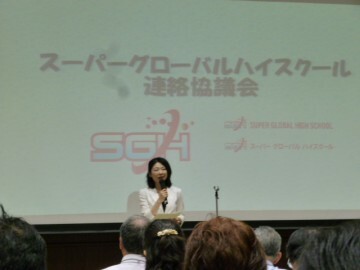 A more detailed explanation about SGH’s activity and curricula was held in Japanese. Also the students talked about the reasons and motivations they had in choosing the SG Focused Area Lecture series. 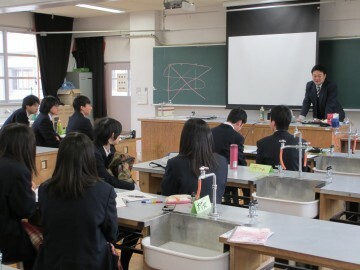 The Nishi Junior High students looked impressed by their seniors whom, despite being only 2 years older, were saying that they want to contribute to society. 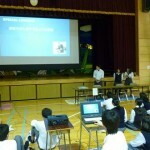 For our students, it was good to make presentations in front of their juniors in order to broaden their perspectives. Robert Normile Robert is an English teacher from Liverpool, United Kingdom, hometown of The Beatles. After his graduation from the University of Liverpool’s School of Engineering, he spent a time working in Australia. 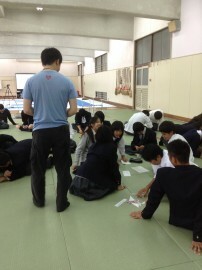 After coming to Japan, he worked for a long while at the country’s largest chain of English conversation schools. 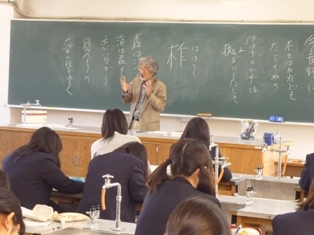 He was ranked at the top of the list of “teachers who I want to be taught by” throughout the whole of Japan. Thereafter, he taught as an ALT, a part-time and a full-time English teacher at public and private junior and senior high schools and vocational schools, and trained engineers in English at various corporations. Mr Normile speaks fluent Japanese as well so he can help the explain any points that students do not understand. His lessons are popular because they are communicative and fun. Timothy Kaan Mr. Kaan is from Edmonton, Canada, which is surrounded by nature and regularly holds large festivals. He is bilingual, speaking both English and Japanese, as he grew up in both Canada and various places across Japan due to his parents’ jobs. After he graduated from a Canadian university, he came to Japan and completed his master’s degree in Japanese Studies at Osaka University. 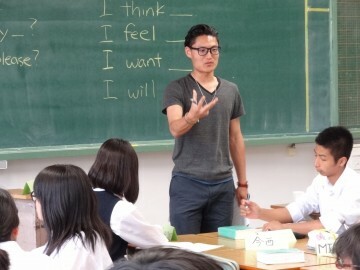 He has been teaching English language as well as other subjects in immersive English in school such as Kwansei Gakuin University, Osaka Sangyo University and other public and private junior and senior high, vocational, and language schools. He also has a wealth of knowledge in various academic fields from history of literature to sociology. 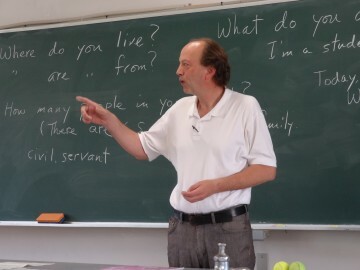 In universities, he teaches cultural anthropology, comparative culture, peace studies and other subjects in Japanese. 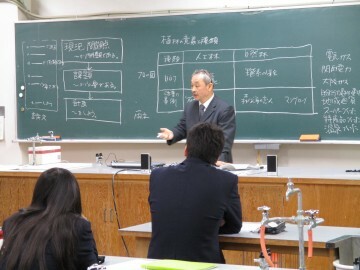 In our school he enhances our students’ presentation skills, with the help of his fluent Japanese. Toshiyuki Tojo Mr Tojo was born in Tokyo and grew up in New York. He moved to New York shortly after he was born and lived there until the age of 15. He excelled in soccer, and was called up to represent the east area of the U.S., traveling to Italy and Argentina to play for the team. After he came back to Japan at the age of 15, he played for Tokyo Verdy’s youth team, and was even aiming to be a professional player. After graduation from a Japanese university, he worked as an international salesperson and traveled to India, Dubai, Thailand and Hong Kong. Eventually he set up his own business in English education. 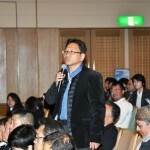 He also does translation, prepares documentation and provides support for companies wishing to expand overseas. His motto on English education is “English is not a goal but a tool”. He strongly believes that English is tool for communication, and that the important thing is communicating with foreign people using that tool. 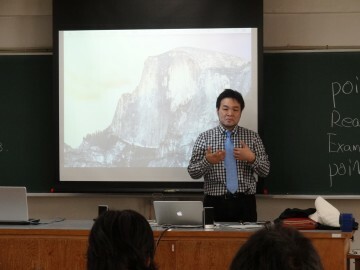 In our school, he gives lectures on “living English” structured around searching on the Internet. 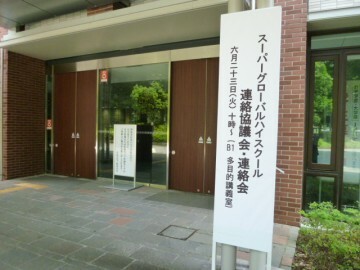 ” from the principal” On Tuesday Jun 24th, myself and the teacher in charge, Mr Togashi, attended the first meeting in 2015 of the SGH Liaison Council and SGH School Meeting, which was held at the Bunkyo campus of the University of Tsukuba, Tokyo. 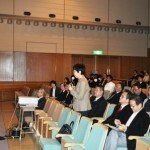 The Liaison Council was opened by Mariko Kobayashi, head of International Education Division at MEXT. Ms Kobayashi’s opening speech was about the necessity of exploratory learning, mid-term evaluation and continuing the spread of the project. 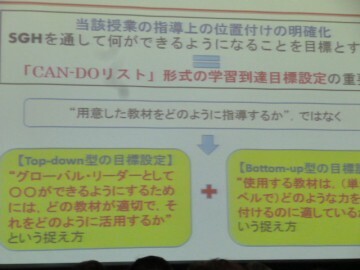 Hideaki Kogo, a researcher at the National Institute for Educational Policy Research, instructed us to make a CAN-DO list to better monitor the results of the project. 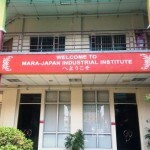 In addition, Tadayuki Arai, the assistant manager of the International Education Division, explained that there will be a mid-term evaluation at the third year of the project, as well as a check on the aims of the project and the usage of the budget. 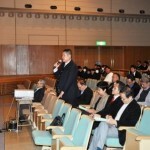 At the meeting in the afternoon, we listened to a speech by Toshiba Ishikuma, director of the University of Tsukuba’s Education Bureau of Laboratory Schools. 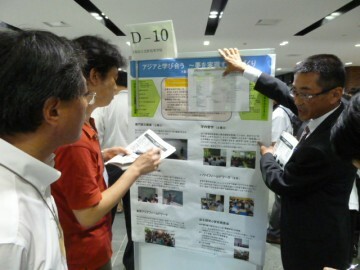 This was followed by presentations about the projects of several schools which were certified as SGH in 2014: the School of Teacher Education’s affiliated Senior High School; the College of Human and Social Sciences at the National University Corporation of Kanazawa University (Kanazawa University High School); Ritsumeikan Senior High School; and Miyazaki Prefectural Gokase Secondary School. Finally we viewed poster sessions of all of 2014’s SGH-certified schools. 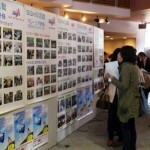 The explanation by MEXT and the schools’ poster sessions really conveyed the seriousness of the SGH program. We are going to be sharing information with other SGH certified schools as we continue apace with our own project and curriculum. ” Industrial Society and Human Beings” On Saturday July 15th, during 5th and 6th period, the second lecture in the Fist Years’ SG Basic Knowledge series was held, entitled “Industrial Society and Human Beings”. 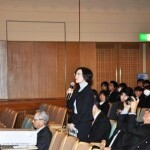 The lecture was given by Ms Yui Akamine from JICA Kansai, and focused on international understanding. During 5th period she held the workshop “What would you bring to a desert island?”, and in 6th period introduced – and held a quiz on – the Republic of Benin, where Ms Akamine stayed as a JOCA volunteer. “from the principal” After school on Tuesday June 2nd of 2015, the first lecture of the SG Focused Area Lecture series was held. 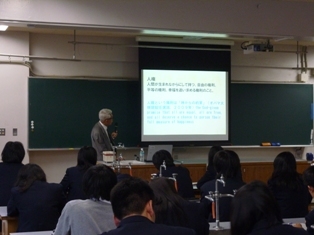 The topic of the lecture series for the Second Year students is “Economic Development and Destruction of Nature”” It is composed of a lecture by Ms Yoko Inui, an associate professor of Osaka Kyoiku University; lessons on English presentation given by English native teachers; and various other lectures. Lectures have also been planned focusing on the investigation of mangrove forests in Malaysia, and workshops at the University of Kuala Lumpur. The majority of the lectures will be held after school or on Saturday. 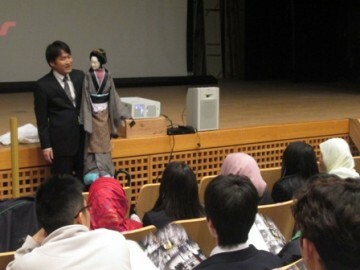 The first class was an introduction to the lecture series, given by the deputy principal Mr Uchida. Students looked a little nervous but they were listening to the explanation seriously. We expect our students to be able to develop their ability as global talents. ” Industrial Society and Human beings” On Monday June 1st, during 5th and 6th period, the first lesson of the First Years’ SG Basic Knowledge lecture was held in the audiovisual room. 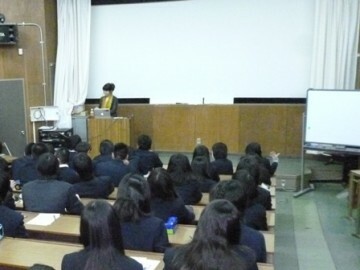 The lecturer was Ms Sanae Nakajima, founder and representative director of the NGO “Free the Children Japan (FTCJ)”. 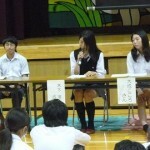 She gave a lecture on the theme “Children suffering from poverty, and what we can do for them”. Through the workshop “If the world was a village with 58 people” in 5th period, students learned about the uneven distribution of wealth across the world. In 6th period, Ms. Nakajima talked about the history of FTCJ, from how it was established through to what activities they are engaged in right now. Students also learned about FTCJ’s efforts to end child labour. 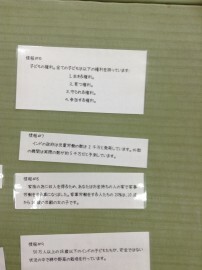 Ms. Nakajima left a message for the students: “the point is to think and act your own way to solve social problems. Use your talent to make a change”. 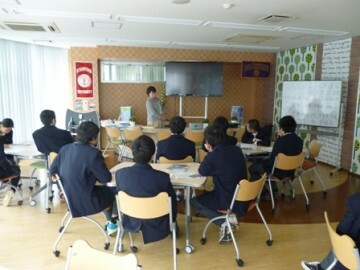 “Integrated learning hour” On April 23, Ms Haruka Tonegawa gave our students a lecture on “The Importance of Foreign Experiences”. 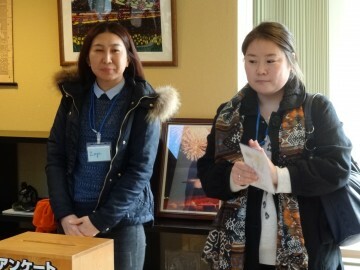 Ms Tonegawa is a graduate of Osaka University’s School of Foreign Studies and was introduced by Ms Ryoko Imaoka, an associate professor of Mongolian at the school. 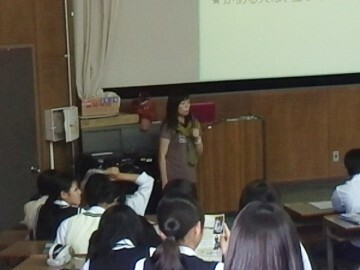 Ms Tonegawa told the students that she had spent time living abroad during university to help shape her future career. She also spoke about the importance of making friends from various backgrounds in order to broaden one’s horizons. The Second Year students have started exchanging emails with students from Malaysia who we are going to visit in the upcoming school trip. 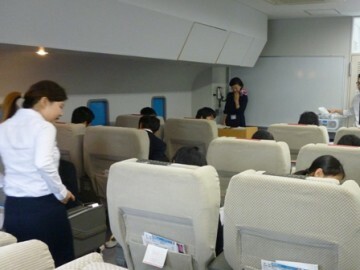 Listening to the lecture before the trip helped the students understand the benefit and importance of making connections with foreigners, and not solely Japanese people.